Looking for an organ builder? All VON members have their own profile page, with extensive information about their company. For contact details and to view recent projects, click on one of the icons below. Click on the world map to see a small selection of special and unique organs built or restored by one of our members. 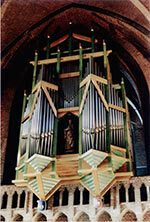 Click on the project to go to the organ builder’s profile. TIP! Double-click on the map to zoom in.